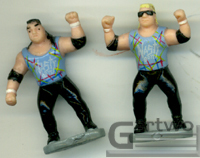 These sets were released at the height of WCW's dominance, shortly before it all came crashing down. 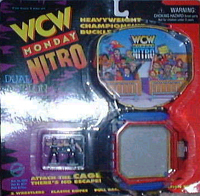 As you can see, the little belt buckles open up to reveal a tiny playset featuring a ring, bell, catapult, and even a steel cage! 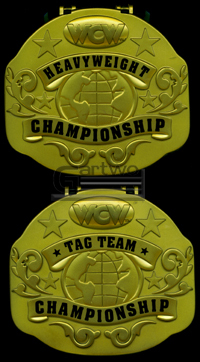 There are two sets: the World Heavyweight title featuring Hollywood Hogan vs Sting, and the Tag Title featuring The Outsiders vs The Nasty Boys. 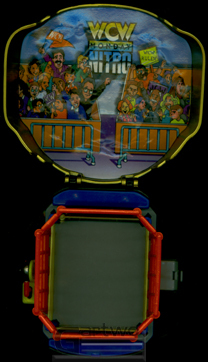 The playsets, closed and opened. 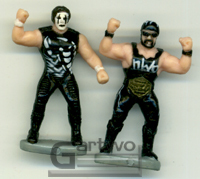 Sorry for the dark pics!